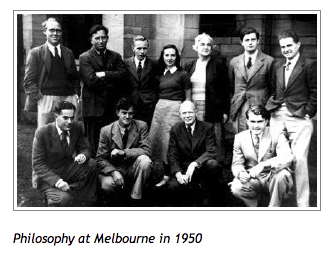 The program of Philosophy at The University of Melbourne is an old one, with a wealth of history and achievements. Philosophy was taught at the University from its foundation in 1853, and the Boyce Gibson Chair of Philosophy, founded in 1886 is, in fact, the oldest chair of philosophy in Australia (though it was given its current name only in 1966, after the retirement of Sandy Boyce Gibson, who succeeded his father, W. R. Boyce Gibson, in the Chair). The then Department started off modestly, with the appointment of Henry Laurie, who was as much professional journalist as professional philosopher. But over its life, it has grown in strength and reputation. One small statistic is an index of this. When the University was founded, it had a total 16 students. The number of students who take philosophy subjects each year is now in the thousands. The early years of the Department were marked by a rivalry with the Philosophy Department of the University of Sydney. Most notably, in the 1940s and 1950s, when Sydney was under the influence of the realism of John Anderson, Melbourne developed a strong Wittgensteinian reputation, under the influence of Douglas Gasking (who succeeded the second Boyce Gibson in the Chair), Camo Jackson, and George Paul. The Wittgensteinians had a strong impact not only on philosophy but also on the intellectual life of Melbourne University generally. Sandy Boyce Gibson fostered an open-spirited ethos in the Department, a spirit that is concerned to represent different traditions. This was true even in the Department's Wittgensteinian period, and remains the case today. The Department has always taught both "analytic" and "continental" philosophy (indeed W. R. Boyce Gibson studied in France and Germany, and translated Husserl's Ideas into English); increasingly, now, it is also teaching Asian philosophy. The program has always prided itself on its teaching. It has produced a number of graduates who have gone on to have a major international impact on philosophy, such as Frank Jackson, Peter Singer, and Mark Johnston, as well as many who have gone on to distinguish themselves in the arts, government, and other areas of public life. Many members of the program have also, of course, had notable international reputations. Apart from some of those already mentioned, these include Len Goddard, who held the Chair of Logic and Metaphysics at the University of St Andrews before succeeding Gasking in the Boyce Gibson Chair, and David Armstrong, who moved from the Department to take up the Challis Chair of Philosophy at the University of Sydney. Many outstanding international philosophers, such as (the now sadly late) David Lewis, and Jay Garfield, have also been frequent visitors, and strongly involved in the intellectual life of the Department. The program is now a major player on the world scene in philosophy. Two of its current research strengths are in Applied Ethics (a major interest of Tony Coady, who succeeded Goddard in the Chair) and Philosophical Logic (a major interest of Graham Priest and Greg Restall). In both of these areas, the program was recently recognized by the Leiter Report - a report based on peer review of English-language Philosophy Departments, published by Blackwell - as one of the top handful in the world. The University of Melbourne was founded in 1853. For some years, Philosophy was studied only as part of Classics. Independence came in 1881, when Henry Laurie, a former student of the University of Edinburgh who had, as the editor of a provincial newspaper, campaigned for extended teaching of Philosophy, was rewarded with a Lectureship in Logic. In 1886 he was appointed to the newly created Chair of Mental and Moral Philosophy. Laurie was succeeded in the Chair in 1911 by W.R.Boyce Gibson, an Oxford graduate who had studied at Jena and there been much influenced by the ideas of Rudolf Eucken. To the promulagation of these in Australia he devoted much effort, though his more enduring contribution arose from his later interest in Husserl, and particularly from his translation of the Ideas, which for many years remained the standard. In 1935 W.R. Boyce Gibson died. 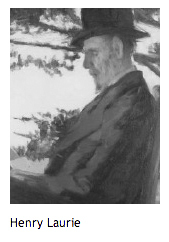 His son, Alexander ('Sandy') Boyce Gibson, then a Lecturer at the University of Birmingham, succeeded him in the Chair, which he held until his retirement in 1965. Under the younger Boyce Gibson, the Department expanded considerably. Gibson pursued a policy of even-handedness in appointment which gave his Department a diversity of philosophical and religious outlook which has remained a trademark. At the same time, a broadly Wittgensteinian perspective gradually emerged as the dominant one of the period, thanks to the powerful advocacy of three of Wittgenstein's former pupils - George Paul, Douglas Gasking, and A.C. Jackson. In 1966, the Department found itself Boyce Gibson-less for the first time since 1911. This situation was rectified by renaming the Chair the Boyce Gibson Chair of Philosophy, and appointing Douglas Gasking to it. Under Gasking's benevolent rule the Department flourished until his retirement in 1976; perhaps his greatest contribution was the appointment of the author of these notes. In 1977, Gasking was succeeded in the Chair by the logician Leonard Goddard from St Andrews, who brought into the Department a more formal perspective than that which had traditionally been adopted. After his retirement in 1989, Goddard in turn was followed by Tony Coady, who retired from the Chair in 1998 to take up a prestigious ARC Senior Research Fellowship. The Department of Philosophy was renamed the School of Philosophy in 2007. Following a comprehensive restructure of The Faculty of Arts in 2008, the School was expanded to incorporate the Faculty's programs in Anthropology, Development Studies, Gender Studies, History and Philosophy of Science, and Social Theory. It is was known as The School of Philosophy, Anthropology and Social Inquiry (PASI). In 2011 another restructure has taken place where Philosophy joins The School of Historical Studies to form The School of Historical and Philosophical Studies (SHAPS). The current Head of School is Professor Trevor Burnard.